Around the small settlement of Mexican Hat in southeastern Utah, the San Juan River is slow-moving and flows through a relatively shallow red rock canyon with many wide curves; more of these convolutions can be seen in the nearby Goosenecks State Park, reached by a four mile paved side road (UT 316) that branches off UT 261 a little way north of town. The park, to which entry was for many years free but is now charged at $5 per vehicle, has just one extended viewpoint of several huge river bends, now flowing one thousand feet below ground level in a deep canyon formed by a series of stepped cliffs and terraces, a feature recognized as one of the best examples of entrenched river meanders in the world. 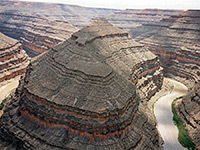 At the park, the waters flow through 5 miles of canyon whilst progressing westwards only one mile. Beyond the visible meanders, the river continues to twist and turn as the canyon deepens, before joining Lake Powell after about 35 miles. Camping is allowed at the viewpoint for a fee of $10 per night, and although there are few facilities, this is a great place to spend the night - visitors can park just a few feet away from the cliff edge and gaze down onto the river far below - perhaps glimpsing rafters taking the long boat trip to the lake, or in the evening just watch the effect of the setting sun on the far canyon walls, which become yellow then golden red as nighttime approaches. The main, paved camp/park area is a 300 foot loop, but vehicles can also be positioned anywhere along a track that follows the rim southwards for one mile. 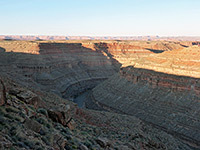 There are no official trails at the state park, and climbing down to the river is certainly not possible, owing to several levels of vertical cliffs, but it is easy to walk at rim level in either direction, as far as desired. An unpaved 4WD track (FR 244, Johns Canyon Road) leaves UT 316 and heads northwest across the plateau between the ever deepening river canyon and nearby Cedar Mesa, eventually leading far into the Glen Canyon NRA and reaching the banks of the river. This passes several remote side canyons with ruins of Anasazi cliff dwellings. 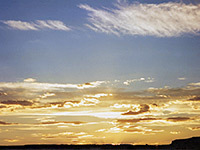 The river originates in the San Juan Mountains of Colorado, and many millions of years ago flowed gently across a flat landscape, forming large meanders that frequently changed position. 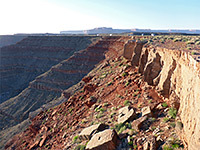 Uplift associated with the creation of the Colorado Plateau caused the river gradually to become entrenched, preserving its most recent course in the deep canyons seen today. The greyish-red rocks forming the sides of the gorge are shale and limestone from the Paradox Formation and the Honaker Trail Formation, up to 300 million years old.